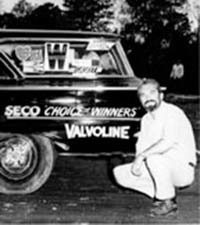 SEMA Hall of Fame - John Simmons, 2004, SECO Performance Centers. John Simmons got into the performance parts business out of necessity—the necessity to go fast. After graduating from high school in Birmingham, Alabama, Simmons went to work for his father’s electrical small appliance repair business. He started a repair parts mail-order business and called it SECO. Frustrated by the fact that he couldn't get the performance parts he wanted to fulfill his need for speed, Simmons started his own warehouse distribution business for performance parts in 1962. He began selling parts from a trailer that he hauled to racetracks on weekends. By 1969, the electrical business was closed so he could focus all his efforts on the performance side of things. His business savvy and tireless effort allowed him to grow SECO into the thriving wholesale and retail business it is today. In addition to his performance-parts business, Simmons found other ways to satisfy his need to go fast. In the early ‘60s, John owned and operated Helena Dragstrip, a place where local racers and enthusiasts could go to race. The track was closed in 1967 due to noise. Undaunted, he and his partners acquired Lassiter Mountain Speedway, which they ran for 10 years. He also had a car that he and a partner raced at tracks around the Southeast. Simmons joined SEMA in 1969. It was the beginning of a long and fruitful relationship. Simmons served three terms on the SEMA Board of Directors from 1978 to 1982, he chaired the SEMA Finance Committee in 1981. He served on the Awards Judging Committee from 1984 to 1986, chaired the Person of The Year award in 1987 and also served as membership Committee Chairman. In 1977, Simmons received an award for recruiting more new SEMA members than any other individual. Throughout that time—and up to today—whether he was at racing events or out making business calls, Simmons always encouraged people to join SEMA, urging them to get involved, and he was never shy about explaining how SEMA could benefit them and their businesses. In 1980, Simmons was named SEMA Person of the Year. All along the way, Simmons made it a point to help others grow and succeed in their businesses. In addition to his SEMA efforts, he was elected and served as a Performance Warehouse Association (PWA) Area Director from 1974 to 1991, served two terms as PWA Treasurer and two terms as National Director of PWA. He received the PWA Pioneer Award in 1993 and was one of the founding members of the AAM/Parts Pro group. In his many years of service, Simmons says he never missed a PWA or SEMA Board meeting. Today, Simmons handles all of the advertising for SECO and enjoys spending considerable time at his second home in Panama City, Florida. The company he founded remains in the family, with his daughter, Anne Thomas, serving as owner and operator. Thomas is serving a second term on the SEMA Board of Directors and is the Treasurer of PWA.